Sandra- sorry for the delay this message slipped through the cracks. Please check your local Kroger they should have Dixie Lily Corn Meal and Dixie Lily Grits. Thanks for reaching out. Need your product… gluten free. Thank you so much for contacting us. Corn is gluten free in nature, however, we cannot label our corn meal as gluten free because of the chance of trace cross contamination that could happen at any point as our product travels from the farm to your table. We are in the process of getting our stone ground corn meal certified gluten free but we have not completed that process as of yet. We appreciate your suggestion. Our recipe for cornbread doesn’t work well with this product, stone ground cornmeal. Do you have a suggested recipe? Thought maybe it’s because it seems to be ground finer. Thank you so much for contacting us. We assume that your saying that your cornbread recipe is not working because it is too dense when you use our stone ground cornmeal. You are correct that stone ground cornmeal is finer than machine cut cornmeal. Because stone ground cornmeal is finer than machine cut cornmeal it will not rise as well as machine cut cornmeal. 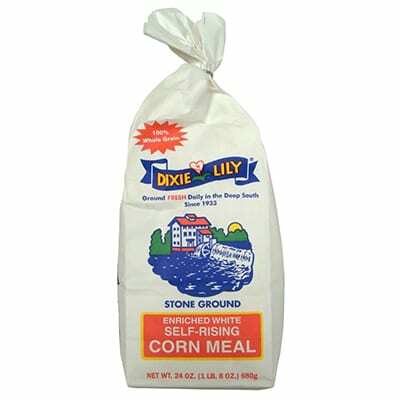 If you are looking for lighter and fluffier cornmeal then please try our Dixie Lily Self Rising Cornmeal with your cornbread recipe and let us know how it turns out. We appreciate your business and we hope this helps. Next Next post: Dixie Lily Yellow Corn Grits – Gluten Free!